But I think I do know what my guy likes (through a little bit of trial and error... his face hides nothing). Non-sticky lips and touchable hair. That's it. Happy birthday to my amazing man! hahaa seriously... fresh out of bed I am a mess too! Love love love this outfit! Those sandals look great with the boyfriend jeans, and your leopard print blouse is really cute! Love this look, so gorgeous. I adore pairing elegant heels with boyfriend jeans. Yup, I definitely have a wild mane when I get out of bed too! And my bf just can't stand my MAC amplified lipsticks... they have been know to stain his lips in the past! I love this outfit! And I know what you mean, I am not looking good fresh out of bed. Men what they know anyways. :D I love that top by the way. What a cute post! Haha, so true that guys don't even understand what they think they like! 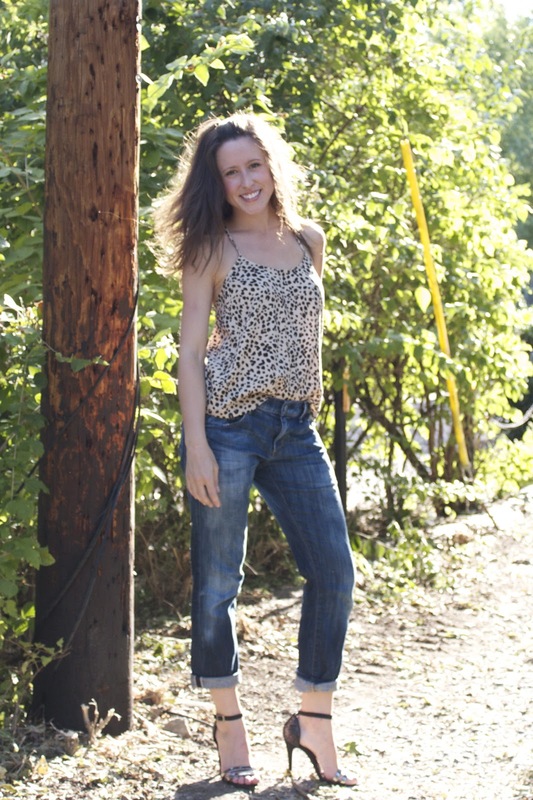 :) Great Friday/date night look, I love the leopard top and those heels! Wow lady - you are smokin'! And yeah - those sorts of articles make me LOL pretty hard. Have a great weekend! I always love the combonation of a great fitting air of jeans, and tank and then some killer heels, so effortless! oh man you totally knew we would all have this song stuck in our heads for the rest of the day. damn you. :) looooove boyfriend jeans. Love the look. Have fun celebrating the birthday! Loving this, so easy and chic! I don't know what I would do without a straightener! You look fab! I thought the very same thing when I read that in Cosmo--I wondered how many guys think a girl is not wearing makeup when actually she's perfected the "bare-faced look" (with makeup). If guys had to take a poll that showed our true just out of bed looks, I'm not so sure the results would be the same, haha! Anyway, I love this sassy leopard print and heels look! This outfit is cute girlie. I love, love those boyfriend jeans. Too cute! Jessica you look fierce! He is one lucky guy! Happy happy birthday to him, hope you both have a fantastic night celebrating! Cute casual look, I love the bf jeans on you! Love the mix of relaxed jeans and chic heals, with a pop of jazz with the shirt!